The Mande people, also spelled Mende, are one of the two largest people groups in the west African country of Sierra Leone. They predominantly migrated from the Southern and Eastern Province of Sierra Leone from the cities of Bo, Kenema, Kailahun, and Moyamba. They speak Mende, which is spoken by one half of the population of Sierra Leone, including people groups who do not claim Mande as their people group identity. Historically, the Mende people were settled in the United States as slaves and thus a large percentage of African Americans trace their ancestry to the Mende. However, in the past 20 years a new wave of Mende who are not assimilated into mainstream American culture have migrated to the United States. Traditional religion of the Mende includes belief in a supreme creator god, ancestral spirits, and nature deities. Diviners are consulted in times of illness or ominous experience, and the Mende believe in the power of witches. 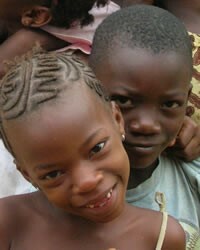 Many Mende are now Muslims or Christians, however. Pray that God will intervene in the lives of Mande people revealing the truth found in Jesus Christ as both the ultimate creator God and intimate personal Savior for peoples. Pray Christians will seek out and minister to Mande people, sharing the message of Christ both in word and deed.